Munojot Yo'Ichiyeva (born 1960), also known under her name Munadjat Yulchieva, is the leading performer of classical Uzbek music and its Persian-language cousin Shashmaqâm. She is famous for the Munojot Yo'lchiyeva, also known under her name Munadjat Yulchieva, is the leading performer of classical Uzbek music and Shashmaqam. She is famous for the unique quality of her voice and her natural charisma. Yo'lchiyeva was born on the 26th of November in 1960 in the village Shirinbulok which is a part of the region Shirinbulok situated in Ferghana valley near Tashkent. From an early age it was obvious she had a great gift as a singer. This nearly resulted in her being lead into a career as an opera singer, but she was drawn towards the slow, aching music of her own ancient culture, something that seemed almost pre-ordained by her name, which means “ascent to God” or simply “prayer”. After finishing the school in 1978, she entered the preparation course of makom performance in Tashkent State Conservatory. She was always accompanied by her master, the famous rubab player, Shawqat Mirzaev. Master Shavkat Mirzaev taught her secrets of performing unique work of singing makom for 2 years. Most of them were recorded for the found of O’zTeleRadio. Her first performance on TV was on the 9th of February in 1980 on the program “Nazm va Navo” devoted to the anniversary of Alisher Navoi. This program was arranged by State Television. She became famous all around Uzbekistan the moment she sang “Ushshoq”, “Munojot” of Navoiy. Since April 1980 she started working as a solo singer in the ansamble “Makom” founded near Uzbekistan TeleRadio Company. After passing her exams successfully the singer was accepted as a first-year student to the Uzbekistan State Conservatory. She started her studies and at the same time her professional career. In 1985 she graduated the Conservatory successfully. In 1991 she was awarded “Honored artist of Uzbekistan”, in 1994 the award of “National artist of Uzbekistan”, in 1998 the order “El-yurt hurmati” for her work devoted to the development of Uzbek classic music. 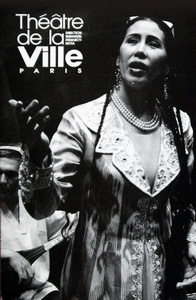 She took part in International Festivals in 1995, 1997, 1999. Besides, she won the award of first place in International Music Festival “Shark taronalari”. From 2000 till 2004 she worked as a member of foundation “Protection of financial and nonfinancial human resources:” of UNESCO. In 2001 she got the award “Ofarin”, in 2004 the orden “Fidokorana xizmatlari uchun” and the laureate for “ВВС Word Music Awards” from Asia. In 2006 she became honored professor of Uzbekistan State Conservatory. The songs performed by Munojot were recorded in Tashkent Gramophone in 1981. Moreover, she recorded audio albums in France in 1995, in Germany in 1997. She has performed in Germany, Austria, France, Belgium, Holland, Italy, Spain, Switzerland, Norway, Swiss, Finland, England, USA, Japan, Southern Korea, China, India, Pakistan, Brazil, Marrakesh, Ukraine, Russia, Jordan, Tunis to promote Shashmakom and national songs on her solo concerts and in some other renowned festivals. From 1982 till now she has been working as a solo singer in the Academy of classic troupes named after Muhiddin Qori-Yoqubov. For many years she has been cooperating with an ensemble under the guidance of professional musician and composer Shavkat Mirzaev. Her repertoire includes many of his compositions, and she usually performs with his ensemble. Typically the group use local instruments such as the dutar (two stringed lute), the tanbur (3-stinged lute), a gidjak spike fiddle, doira frame drum, ney flute and at times the chang zither. Those lucky enough to attend one of her rare concerts abroad will witness a sumptuously dressed performer of startling gravitas and charisma, with long braid hear trailing down to her waist. In 2005, she performed at the Austrian Music Festival Glatt und Verkehrt. Only two recordings of her music are widely available - the first for the French label Ocora (1994) and the most recent (1997) on Germany's Network label, which has the subtitle A Haunting Voice.